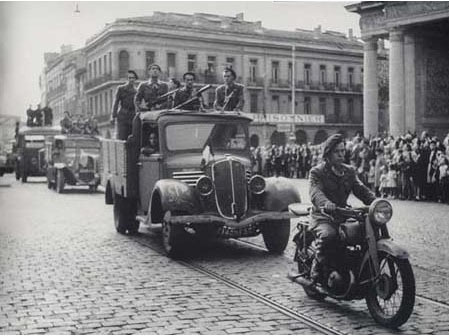 Spanish units that had been working with the FFI as the Organización Militar Española of the Union Nacional Española (UNE), the communist-led coalition, changed their designation in May 1944, becoming the Agrupación Guerrillera Espanola. In July 1943, command was decentralized into divisions and brigades based on regions and departments. Miguel Angel was appointed to represent the Spanish guerrillas at FFI headquarters, and Albert Luís Fernández was made joint commander with Ljubomir Hitch of the MOI. It was understood by all concerned that the Spaniards would continue to operate in their own formations and under their own officers, although generally under the orders of the FTP and the FFI.10 The UNE built a broad coalition grouped around the Spanish Communist Party. It included such disparate elements as monarchists, Navarrese traditionalists, and Gil Robles’ Confederación Española de Derechas Autónomas (CEDA), a federation of small, independent rightist parties. The anarchists developed a separate understanding with the French Comité National de la Résistance and cooperated with the FFI and the confédération Générale du Travail, the French labor federation. Although committed to a strategy of sabotage rather than massive confrontation, they pledged to engage in the latter when an Allied land-ing occurred and the French people rose in national insurrection. Anarchist participants in the campaign would fight in their own units, commanded by their own leaders. They also reserved the right to regain their liberty of action when the war had been won, so that they could turn their full attention to liberating the Spanish homeland. In establishing official connection with the French, the anarchists felt that they had broken the communist “encirclement” of their movement and had preserved the separate identity and integrity of their organization. They had secured the cooperation of the FFI and gained the means to provide haven and support to those comrades who daily fled the threat of forced labor in Germany and wished to fight under their own banner.12 Only in the regular French army and in predominantly French Resistance units would the anarchists submit to authority other than their own. The heaviest concentration of Spanish Maquis was in the southwest and the Pyrenees, but there were strong formations of them in many other areas. In the Alps, Spaniards fought in the departments of Haute-Savoie, Savoie, Isère, Ain, Jura, and Drôme. They participated in three of the largest Resistance engagements of the war—the Plateau of Glières, the Vercors (Isère and Drôme), and Mont-Mouchet (Auvergne) —as well as in hundreds of other actions. The success of men like Gutierrez demonstrated the effectiveness of the classic guerrilla pattern, wherein small, highly mobile groups at-tacked the enemy on their own terms, usually in surprise maneuvers. The negative dictum, that of avoiding at all costs the amalgamation of large groups of men in static positions and engaging the enemy in frontal combat, was to be disregarded by the Resistance in two instances—once in the Alps and once in the Massif Central—with catastrophic results. In the south anarchists either fought with their own units or integrated into French groups because of their antipathy to communist control. Jose Cervera lauded the French command in the department of Lot, which greeted them cordially and respected their philosophy A special Spanish unit of thirty-one men earned the respect of Soleil, the French commander, in a variety of missions. At one point, Cervera was suggested for a lieutenancy The French communists objected, pointing out that Cervera was an anarchist, a member of the CNT, and that it was humilating for Frenchmen to serve under a Spaniard. Soleil replied that such considerations had no place in the Resistance. He cited Cervera’s record of combat and the fact that he had volunteered for the most dangerous missions. Despite Soleil’s stand, the promotion failed to materialize. Cervera and his group later joined the Libertad Battalion, an all-anarchist unit under the command of Santos, and took an active part in liberating Cahors and other towns.58 Spanish guerrillas also fought in every department of southwestern France, participating in the liberation of Marseille and Toulon and harassing German troops retreating northward.59 During 1943 and 1944 the Maquis managed to mount 535 missions in the Bouches-du-Rhone, including 98 military sabotages, 110 attacks against industrial and supply targets, and 74 assaults on German personnel. The Resistance movement had survived severe repression, including the gigantic round-up of citizens in Marseille on January 24, 1944, which had resulted in 2,000 deportations to Germany. The departments of Lozère and the Gard, potential escape routes for the German army, saw heavy fighting. It was in Lozère that the Maquis group Bir Hakeim was betrayed, ambushed, and murdered. Cristino Garcia Grandas operated in the Gard, participating in the rescue of political prisoners from the prison of Nîmes and in the classic guerrilla battle of La Madeleine. Cristino Garcia and Carlos Alonso were also responsible for planning and executing the rescue of fifty political prisoners from the jail at Nímes on February 4, 1944. The resisters were awaiting shipment to Germany.62 Prison rescues and breakouts, such as those at Nîmes, Toulouse, and Nontron, were frequent occurrences. The insurrection at the prison of Eysses (Lot-et-Garonne) was perhaps the most spectacular attempt of this nature, although it failed in its objective. Eysses was a regional facility for political recalcitrants and common criminals. In late 1943 it held twelve hundred prisoners, the majority French, but including eighty-two Spaniards and an unknown number of Russians, Poles, Englishmen, and Italians. One hundred and fifty-six political prisoners formed the Bataillon d’Eysses, with the intention of organizing a mass breakout. Assistance was given by local adherents of the National Front, who provided machine guns, small arms, grenades, and ammunition. A few guards were among the friendly forces.63 Francois Bernard, an ex-International Brigader, was chosen as commander. It was agreed that the next prominent official to visit the prison would be isolated, captured, and held hostage. The prisoners would exchange garb with the guards and immobilize additional prison personnel. Several squads of rebels would assault the watchtowers. The balance of the resisters would appropriate some trucks and rush the main gate. Then they would storm past the gardes mobiles headquarters, situated about fifty yards from the gate, and escape into the nearby forest. The Spanish comrades propose to assault the northwest watchtower. They were all “volunteers of death” in the sister Republic, from 1936 to 1939. Their group comprises a dozen men. Whoever knows a Spanish brother in these difficult moments has a unique privilege. Is it our common struggle that has bound us more strongly still? The spirit of the French and Spanish Resistance fighters, as exemplified by the Bataillon d’Eysses, had enabled them to survive ferocious repression from Germans and collaborationist French, to grow stronger in numbers and material, and finally to accomplish the liberation of the south virtually by themselves.68 In the north and west of France, the character of the Resistance was to be somewhat different, tied as it was to the great military effort of the Allies. But in those areas too, Spaniards were to play a meaningful role in ridding France of the two masters who had ruled it so harshly from 1940 to 1944. Pierre Bertaux, Libération de Toulouse et de sa Région (Paris: Hachette, 1973), p. 90. General Charles de Gaulle, in presenting two medals to Garcia Calero at a victory parade in Toulouse, September 17, 1944; Alberto Fernández, Emigración repúblicana española 1939-1945 (Alcorta: Ediciones Zero, 1972), quoted by Pons Prades, p. 83. Colonel Rol-Tanguy, Regional Chief of the Forces Françaises de l’Interieur, Ile-de-France, in preface to Angel, p. 9. Vilanova, pp. 310-315; Angel, pp. 7, 9, 85-87, Bertaux, p. 57 Vilanova lists Spaniards as fighting in more than fifty departments. Pons Prades quotes Nogueres, p. 66, as saying that Spaniards fought in three-quarters of the departments. Charles de Gaulle, The Complete War Memoirs of Charles de Gaulle (New York: Simon and Schuster, 1972), vol. 2, p. 581. Vilanova, pp. 311-12; Pike, p. 113n. Colonel Serge Ravanel, in prefatory note, Angel, p. 11. Ibid., p. 13; Pons Prades, p. 19, quoting a letter from Captain Dronne. See also Vernant, p. 221. Robert Aron, France Reborn: The History of the Liberation, trans. Humphrey Hare (New York: Scribner’s, 1964), pp. 163-65. Pons Prades, p. 65; Angel, pp. 74, 82, 85, 91. Berruezo, p. 248; Jackson, pp. ix—x; Manifiesto of the Spanish refugees of Draguignan (n.d.); A Todos Los Antifascistas, manifesto announcing formation of Alianza Democratica Española in Marseilles (October 1944). Luis Companys, as noted previously, had been handed over to Franco and executed. Report of Direction de la Securité Militaire, Algiers, August 31, 1943, marked SECRET 44115, National Archives, Washington, D.C.; Berruezo, pp. 110, 154; Report of Office of Strategic Services, “Labor Deportations and Resistance,” CONFIDENTIAL 39014, written June 19, 1943 and distributed July 19, 1943, National Archives, Washington, D.C.
Report from Captain Leveque, commandant of Gendarmerie, Ceret, to prefect, Pyrénées-Orientales, SECRET, no. 68/4, May 15, 1943; Letter from subprefect of Prades, to prefect, Pyrénées-Orientales, no number, May 25, 1943. Both citations from departmental archives, Perpignan. Letter from M. Lazare Perramond, chief of 427th Group, Travailleurs Etrangers, to the prefect, Pyrenees-Orientales, no. 6553 MO/ AM, August 2, 1944, on “Desertion Massive de Travailleurs Etrangers,” reported the desertion of twelve Spaniards from a forest work crew; thirty-five desertions were reported from another forest gang near Ballestavy, in a letter from the prefect of the Pyrénées-Orientales to the secretary general of the Maintenance of Order, no. 288, August 2, 1944. The same letter reports on the desertion of twenty-eight Spaniards from an unnamed location on June 7, 1944, and relates the disappearance of seventeen Spanish miners who apparently re-ceived word that they were scheduled for arrest and transfer to a punishment camp. See also the memo from the secretary-general of the Vichy police to the prefect, Pyrénées-Orientales, no. 15176 Police Sureté 6/ RB, December 18, 1943, which expresses annoyance at reports of mass desertions from the Organization Todt and demands a comprehensive inquiry and decisive action. Another letter from Perramond to the prefect of Pyrénées-Orientales, no. 6429 MO/ AM, July 27, 1944, reports the desertion of twenty-one workers, all Spaniards. All from departmental archives, Perpignan. Note de Renseignements, from Commandant Lazare Perramond, 427th Travailleurs Etrangers Group, to prefect, Pyrénées-Orientales, no. 153, January 12, 1944, departmental archives, Perpignan. Paxton, p. 298, says that under Darnand French-German collaboration against the Resistance reached it’s climax. See also Angel, p. 196. Angel, pp. 72-73, cites the report of the Eighth Brigade of Security Police to the principal commissioner at Toulouse, no. 2.38/436, May 8, 1943. Report no. TB-104, Office of Strategic Services, “Darnand Campaign Against the French Resistance,” SECRET 62365, March 16, 1944, National Archives, Washington, D.C.
Letter from prefect, Pyrénées-Orientales, to central commissioner, Perpignan, no number, January 25, 1944; letter from prefect, Pyrénées-Orientales, to prefect, Regional Office for the Maintenance of Order, Montpellier, no. 213 Cabinet, May 22, 1944; both from departmental archives, Perpignan. Letter from Second Group of Travailleurs Etrangers, Toulouse, to regional prefect, Toulouse, no. 1002/ AP, March 4, 1943. The commandant complained that Spanish miners working near the Col de Puymorens were virtually unreachable because the snow blocked access to their locale. He was aware that they were stealing dynamite and arms and conveying them to Andorra, which was only four kilometers away; departmental archives, Perpignan. Letter from principal commissioner of General Information, Pyrénées-Orientales, to divisional commissioner, Montpellier, no. 3493, January 6, 1944; Letter from principal commissioner of General Information, Le Perthus, to subprefect, Ceret, no. 641, March 10, 1943; Letter from Joseph Landi, police inspector, Criminal Investigation Department, no number, May 21, 1943. Letter from principal commissioner, Perpignan, to prefect Pyrénées-Orientales, no. 4440, August 20, 1943, departmental archives, Perpignan. Letter from principal commissioner, Pyrénées-Orientales, to prefect, Pyrénées-Orientales, “Repression of Subversive Menaces on Our Territory,” no. 84, January 22, 1944, departmental archives, Perpignan. Letter from principal commissioner to prefect, Pyrénées-Orientales, no. 3582, June 18, 1943, departmental archives, Perpignan. Aron, 208; Cookridge, pp. 197, 246. Vernant, p. 279; Le Socialiste (Paris), December 29, 1966. The newspaper’s figure of 25,000 includes 10,000 to 12,000 Spaniards who died in German concentration camps. Pons Prades, pp. 240-246. On November 8, 1945, Gutiérrez (Castro) was commended by Colonel Claude Monod, chief of -FFI, Burgundy, Franche Comte, for refusing to divulge information about his Resistance group despite German torture. See also Vilanova, pp. 260-264. The narrative on the Battle of Glières was drawn from the accounts of participants who related their experiences to Montseny, pp. 172-178; Vilanova, pp. 303-305; Pons Prades, pp. 254-261; and Angel, pp. 90, 156-158. The figure of 56 Spanish participants out of a total of 465 is given by Vilanova, p. 303, and is in near agreement with the projection of Angel, p. 156, who put the number of Spaniards at 60 out of the total of 457 J. Barba, who participated in the battle, said there were 80 Spanish Maquis on the plateau and a total of 650 maquisards. Ibid. Barba, in Montseny, p. 177, said that there were 115 graves in the cemetery near the plateau, but he added that others who were killed in action were buried elsewhere. Dreyfus, pp. 153-239; Pons Prades, pp. 262-269; Vilanova, pp. 301-2; R. Aron, pp. 171-208. Amicale Nationale des Anciens Combattants de la Resistance, La France des Maquis (Paris: Editions Denoal, 1964), cited by Pons Prades, p. 200. R. Aron, pp. 177-182; Pons Prades, pp. 200-202; Amicale National, p. 167, cited by Germaine Willard, et al., eds., Le Parti Communiste Française dans la Resistance (Paris: l’Institut Maurice Thorez, 1967), p. 300; Vilanova, p. 305, claimed that 68 Spaniards were killed in the battle. Vilanova, p. 292. Pedro Alba, a sergeant of the first battalion of the Dordogne Brigade, won the War Cross with bronze star for heroism at Saint Astier, August 20, 1944. A direct shell hit on his position killed two Spaniards and wounded six, but Alba maintained fire in spite of constant bombardment. Vilanova, pp. 287-289; Pons Prades, pp. 224-226; Montseny, pp. 147-151. Cookridge, p. 219, says that the massacre was in retaliation for the killing of a German officer in Oradour-sur-Vayres. He also notes that the Das Reich Division arrived in Normandy ten days behind schedule. J. Montoliú in Montseny, pp. 138-140; Berruezo, p. 121; Vilanova, p. 281. Vilanova, pp. 289, 265-268; Pons Prades, pp. 184-185. Angel, p. 171; Casto Ballesta, in Montseny, pp. 141-144. Aron, pp. 375, 387-88. 46. De Gaulle, pp. 682-83. Charles Foltz, Jr., The Masquerade in Spain (Boston: Houghton Mifflin, 1948), pp. 57-58. Bertaux, pp. 99, 34-35; Angel, pp. 95-96. Angel, p. 96; Bertaux, pp. 57-58. Bertaux, pp. 58-59; Fernández, pp. 46-49; Angel, pp. 101-108. Bertaux, pp. 58-59, 64-67 Pon Prades, p. 69, related that Captain Miguel Sanz Clemente was captured by the Gestapo while transporting arms. He was ordered to be shot. While awaiting execution by firing squad he suddenly seized a machine-gun from a truck and killed his firing squad. Then he escaped into the forest. For this exploit he was awarded the Medal of Resistance and the War Cross. Pons Prades (p. 102) told the story of Manolo Morato, who was captured in Carcassonne and ordered deported to Germany. Before crossing the French border he managed to dislodge some floor boards in the train and drop to the roadbed. Badly injured, he dragged himself into forest where he was found by guerrillas. He recovered and fought with them until the liberation. Angel, pp. 136-152; Pons Prades, p. 95. R. Aron, p. 143; “Les Resultats de l’action de la Resistance dans la SNCF, l’Histoire de le FFI,” unpublished mss. by Major R. A. Bourne-Paterson, Captain Lucien Galimard, and Captain Marcel Vigeras, quoted by Cookridge, p. 198; Report of Vichy minister of interior, quoted by Cookridge, p. 198. 57 Angel, pp. 120-122; Raymond Escholier, Maquis de Gascogne (Geneva: Editions Milieu du Monde, 1945), cited by Angel, p. 121, and Pons Prades, pp. 121-123. Guerrero Ortega (“Camilo”) received the War Cross and the Liberation Medal. Jose Cervera, in Montseny, pp. 199-203. Pierre Guiral, Liberation de Marseille (Paris: Hachette, 1974), pp. 79-99. The German troops wished to surrender but were afraid of civilian and Maquis reprisals. They were assured that they would be treated as prisoners of war and protected from mob action. Pons Prades, pp. 116-117; Angel, pp. 129-130. Charles Tillon, Les FTP: la guerrilla en France (Paris: Editions Julliard, 1962), p. 249; Pons Prades, pp. 110-111; Angel, pp. 134-135; Vilanova, pp. 272-276. On October 25, 1946, the commander of the Ninth Military Region, General 011eris, issued a posthumous citation for Lieutenant Colonel Cristino Garcia Grandas. In lauding his achivements, the general said that Garcia’s men had taken thirteen hundred prisoners and killed six hundred Germans; Vilanova, p. 276. There is some disagreement as to the rank held by the German commander. Tillon, p. 249, and Angel, p. 35, said he was a lieutenant general, but Pons Prades, p. 111, and Vilanova, p. 275, called him a lieutenant colonel. R. Aron, p. 317. L Amicale d’Eysses, L’Insurrection d’Eysses (Paris, Editions Sociales, 1974), pp. 47 64-66; Pons Prades, p. 167. Amicale, pp. 94-97; Pons Prades, pp. 171-72. 67 Amicale, pp. 118, 129-135, 137-140; Pons Prades, p. 172; Angel, pp. 212-215. Alberto Fernandez, La España de los Maquis (Mexico City: Ediciones Era, 971), p. 141, gives what he calls an incomplete table of Spanish republican guerrilla activities during the Resistance in France. Spanish units engaged in combat with enemy forces 512 times, took 9,800 prisoners, killed 3,000, liberated 200 political prisoners, destroyed 80 locomotives, downed 150 railroad bridges, cut 600 electrical lines, demolished six central electrical stations, dynamited 20 factories, and sabotaged or inundated 22 mines.